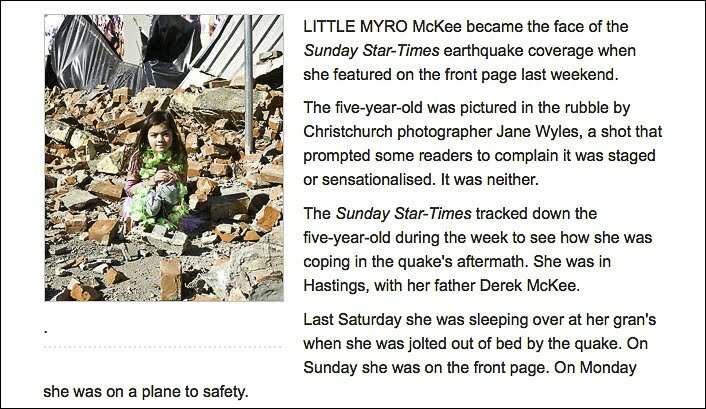 "LITTLE MYRO McKee became the face of the Sunday Star-Times earthquake coverage when she featured on the front page last weekend. The five-year-old was pictured in the rubble by Christchurch photographer Jane Wyles, a shot that prompted some readers to complain it was staged or sensationalised. It was neither." Call me silly, but look at that picture again; does that rubble look like it was from a "home"? And with all the after shocks, why was a little girl allowed to "play" in the rubble? Assuming little Myro was looking at the rubble when the photographer saw her and she was asked to squat among the fallen bricks for that shot; that technically is still a JACK UP photo. Sorry, Mr / Miss "Anonymous"; no apology needed! Huggies (not his real name), a close friend and a Picture editor commented on my link. "CY , I agree with you. How can there not be a better pic when it is the most jialat (the worst) earthquake in decades? Their worry shd be, are there enough pages to use the most touching pictures. The problem is most newsroom are run like paper mill. to do the Unfulfilling and Work for the Ungrateful"
"Definitely it was a staged picture, if I was the photographer I will ask her to hold some toys and look through the rubble with her parents that will be more meaningful! Not posing like this, CY, why should you apologise? You are just pointing out the mistake created by the Sunday-Star Times photographer, they should thank you for pointing up their serious mistake...:) :)"
"Yeah Right!" It would make a good Tui ad! How did it get past the photo editor? Such pose! "CY , I agree with you. How can there not be a better pic when it is the most jialat earthquake in decades? Their worry shd be, are there enough pages to use the most touching pictures. 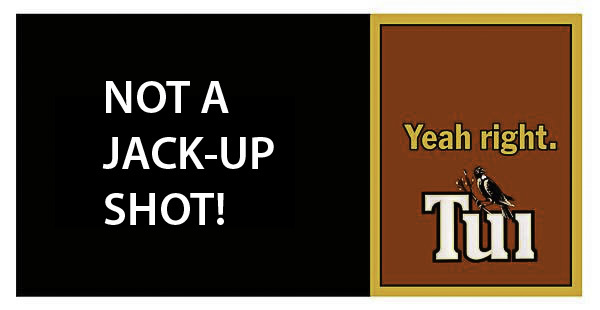 "Yeah Right!" It would make a good Tui ad! How did it get past the photo editor?i. Such pose! Actually not posed at all. My sister is the photographer and described to me coming across the girl, so you're all talking through a hole in your head. And yes it does look like someone's home- if you know Sydenham at all you'd know that much of it is row houses of old brick buildings- no doubt little of it still standing after the last quake- amazes me the pettiness of some people in this world. The photographer is about the most genuine person you could meet and does not do staged photos. I am sure she is a genuine person,if that picture is not posed then it is a REALLY BAD news photograph. All my friends (many who are in the media industry) who saw the picture think it was posed. I suppose the Picture Editor should be fired for using this picture on the front page. Personally I felt there are other better news pictures for that event! I know what I am talking about because I have been a Picture Editor most of my working life. Maybe there were other pictures more appropriate but to have someone fired?? Strong words. Of course I should have realized how superior you are to the rest of us from your initial post. I am getting on with my life BTW, supporting my family and friends in Christchurch and not being a complete ... Maybe you could do or say something with a positive impact and a happy heart instead. I'm not sure that I agree with you that a kid playing in rubble is a bad news story either- I'm sure there are countless opportunities for such photos today in Christchurch. It's been rumbling there for 5 months now so that is their reality- a very sad one with long term impact. It is Jane Wyles here. I am the photographer of the image! Thank you for your comments, and thank you darling sis for your support! Let me just briefly put this straight. I ventured out in a terrified state on the day after the earthquake just locally to where I live. I came across Myro playing amongst the bricks (her parents there of course and she was safe and happy). I took a photographic opportunity of this gorgeous girl who herself said "she was looking at the earthquake". I was NOT a set up, sure it looked third world but it wasn't, it was Sydenham, Christchurch! As the editor and I saw, it, it was a human element that gave a bit of light after such a tramatic event! Now, there are images of bodies being pulled out of rubble, blood smeared faces, some of now are dead! Would you rather see these images? Or of our whole home down in ruins? You obviously have no idea of how tragic this is for all here. Life has changed for us and what is important takes on a new meaning. Save the Children Fund want to use the image in a TV ad so I thank those of you that had something positive to say. As for the Editor being fired ... really? I see this as bitter in your work! The parents, the newspaper and myself are proud of the photo so I will hold onto that. CY was commenting on his opinion of the photo as a very experienced photojourno and photoeditor thats all. Personally the photo doesn't really "strike a cord" for me either just a personal thing really. Gratuitous is the word!This is a photo of damage to shops and she was put there to make the photo appear more sensational.There is nothing natural about this photo! Anyone can see that! My response, lets end this silly feud; no more!